Some outstanding garden plants reward us with beautiful autumn berries, fruits, seeds and seed pods in the fall. Don't neglect to include some of these in your garden, and you'll have plenty of interest outdoors as well as material for beautiful fall arrangements. Acer buergerianum, trident maple, Zones 5-9. Winged seeds (samaras) ripen in the fall and are often very abundantly produced. Ampelopsis brevipedunculata, porcelain berry vine, Zones 4-8. 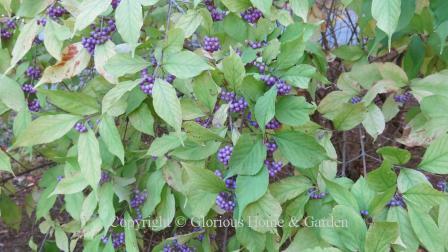 Fascinating autumn berries change from green, to turquoise, to lilac, to purple, and finally to blue as they mature. I've seen them growing wild on Cape Cod near the seashore. Can be invasive. 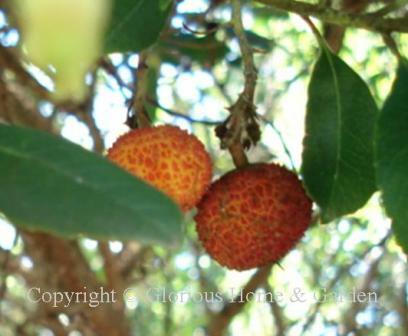 Arbutus unedo, strawberry tree, Zones 7-9. This is an unusual small tree that blooms fall into winter with panicles of small white flowers sort of like a pieris. The striking orangey-red fruits, which resemble a strawberry, ripen the following fall and often appear at the same time as the new flowers appear. Add evergreen foliage and beautiful bark to boot, and you have an interesting ornamental that deserves wider planting. Arum italicum, Italian arum, Zones 6-9. 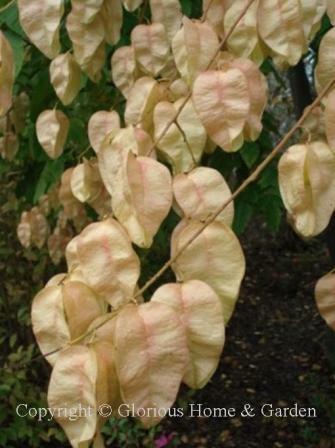 An interesting woodland plant to grow for its leafless stalk of red autumn berries in late summer and fall that look like little ears of Indian corn on a stick. Leaves follow the berries and remain all winter. Berberis thunbergii, Japanese barberry, Zones 4-8. 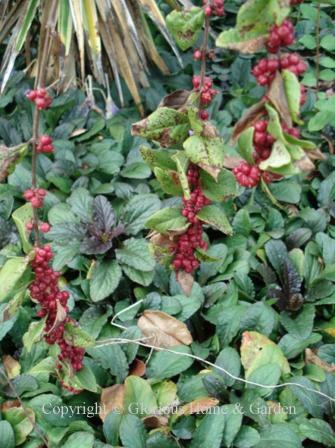 Japanese barberries come in a variety of sizes, shapes and leaf colors and thus they can be used in many situations such as screens, hedges, and barriers due to their spiny stems. 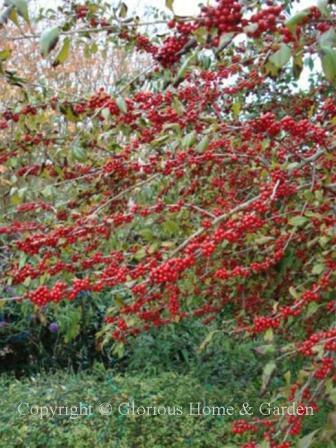 'Kobold' (pictured) is a low rounded cultivar that reaches about 24-30" and produces bright red oblong berries that persist into winter. Beautyberries are well-named. 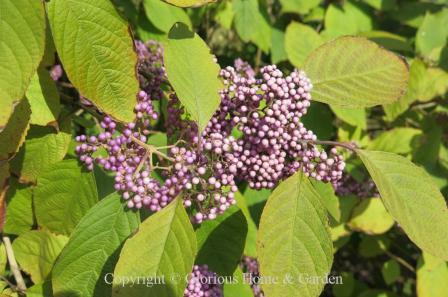 The abundance of striking white, blue, purple, violet or mauve autumn berries that they produce is outstanding and highly ornamental in the garden. Callicarpa acuminata, Mexican beautyberry, Zones 7-10. 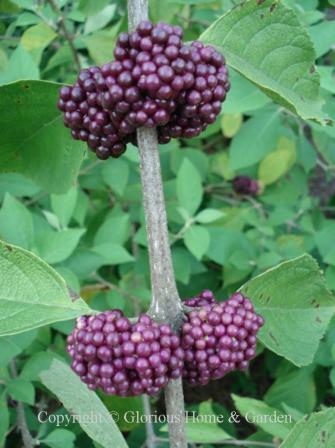 This species has deep mulberry purple, almost black fruits. Highly ornamental color and great en masse. Callicarpa americana, American beautyberry, Zones 6-11. 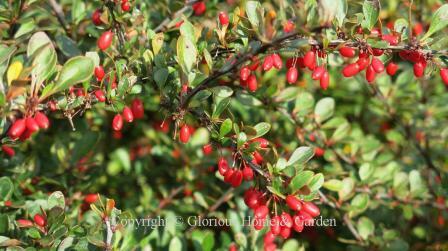 One of our most outstanding native shrubs for autumn berries. Gorgeous violet berries encircle the stem nodes. They begin coloring in late August in Georgia and persist a long time. There is also a white-fruited form. Callicarpa bodinieri var. giraldii, Bodinier beautyberry, Zones 6-8. 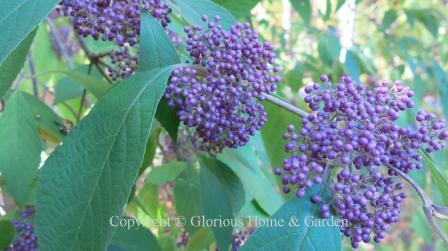 Bodinier beautyberry produces lilac blue berries that are smaller in size than C. americana. Callicarpa cathayana, Chinese beautyberry, Zones 5-8. 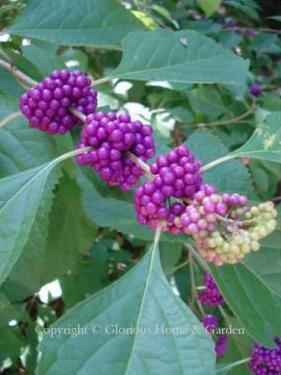 This species of beautyberry boasts lighter mauve-pink berries. Callicarpa dichotoma, purple beautyberry, Zones 5-8. 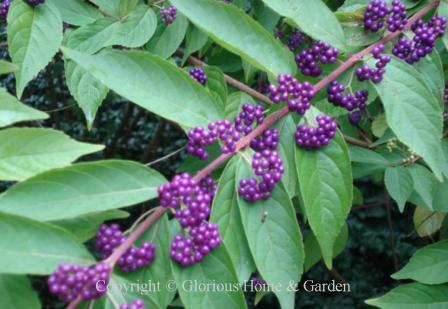 If you have room for only one beautyberry in your garden, consider this one. 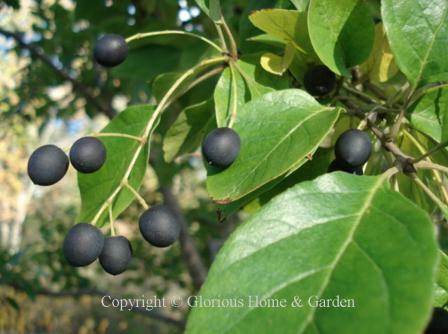 Graceful, arching branches are loaded with violet fruits in late summer into fall. The berries are smaller than those of American beautyberry, and cluster on top of the stems rather than encircling them. There is also a white-berried form called C. dichotoma var. albifructus. Callicarpa japonica, Japanese beautyberry, Zones 5-8. Striking metallic blue fruits show off well against the yellowing foliage in October. Outstanding for a mass planting. Celastrus scandens, American bittersweet, Zones 3-8. A very vigorous vine with yellow to orange seed capsules that open to reveal orange-red seeds. Nice to have for fall arrangements, but unless you have an area to contain it in or an eyesore to cover, perhaps best to just buy some. Celastrus orbiculatus, Chinese bittersweet, is an invasive, non-native plant that should not be planted. Chionanthus retusus, Chinese fringetree, Zones 6-8. Perhaps better known for its clouds of white spring flowers, this tree also shines in the autumn when it produces pendulous clusters of dark blue grape-like drupes. Clerodendrum trichotomum, harlequin glorybower, Zones 7-9. The harlequin glorybower is an attention-getter for sure when the red calyxes reflex back to reveal the blue fruit inside--the effect is like a shooting star. Blooming in late summer and often into fall, sometimes the fragrant, tubular white blooms will be present at the same time as the fruit. Convallaria majalis, lily-of-the-valley, Zones, 3-8. Known more for its sweetly scented white nodding bell flowers in spring, you will also sometimes see bright orange to red berries in the fall that are quite charming and ornamental. Cornus canadensis, bunchberry, Zones 2-6. 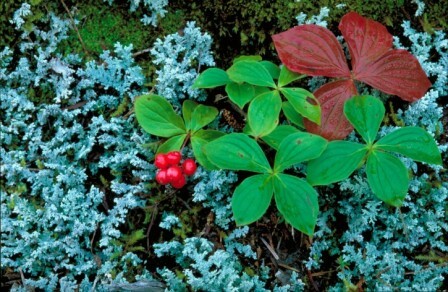 A beautiful groundcover of the dogwood family for moist, acidic Northern woodland gardens, it produces a little bunch of red berries rising from the center of each plant. Cornus florida, flowering dogwood, Zones 5-9. One of our most beautiful native flowering trees, lovely in all seasons. In fall, the clusters of red berries ripen in late summer and fall and persist a long time until eaten by birds, often sparkling through the red fall foliage. Cornus kousa, Kousa dogwood, Zones 5-8. 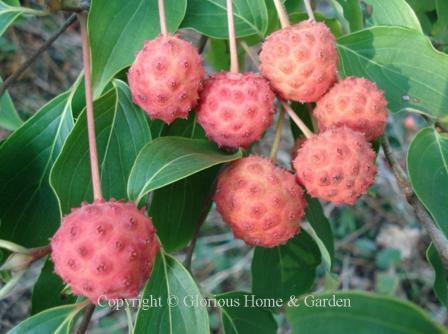 The globular red raspberry-like fruits of this dogwood are very different from that of Cornus florida, and highly ornamental. Cornus racemosa, gray dogwood, Zones 4-8. This is a smallish tree--or more typically a large shrub--that can get up to about 15' tall. Due to the nature of its suckering roots, it can form large colonies, so must be placed with care. 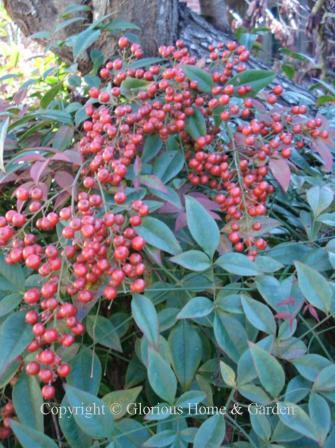 That said, the grayish-white berries that ripen in fall are ornamental--until the birds devour them--and the red stems of the berries are a striking color contrast. Cotoneaster salicifolius, willowleaf cotoneaster, Zones 6-7. 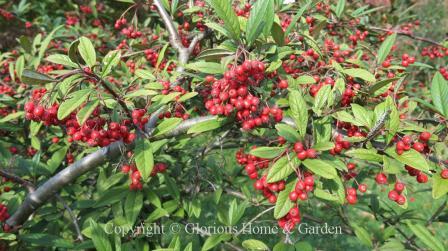 Bright red autumn berries are heavily produced on this wide-spreading evergreen shrub. The species can grow quite large, but there are smaller cultivars that make excellent ground cover shrubs. Crataegus crusgalli, cockspur hawthorn, Zones 4-7. Dark red berries ripen in the fall on this large tree which can reach 3o’. Caveat: Beware the long, sharp thorns! Diospyros kaki, Japanese persimmon, Zones 8-9. No, those are not eggs hanging from the branches! Very decorative orange fruits ripen after the leaves fall (which also make a colorful show) and look like suspended eggs, making this an outstanding choice for the border or as a specimen. Euonymus alatus, winged euonymus, Zones 4-8. Not only do the leaves turn brilliant shades of red in the fall, but bright red seeds dangle like little jewels at the same time. They tend to hide beneath the leaves, so they reward the close observer. Euscaphis japonicus, sweetheart tree, Zones 7-8. Unusual small tree with red pods that open in the fall to expose black seeds. Very ornamental for the autumn garden. 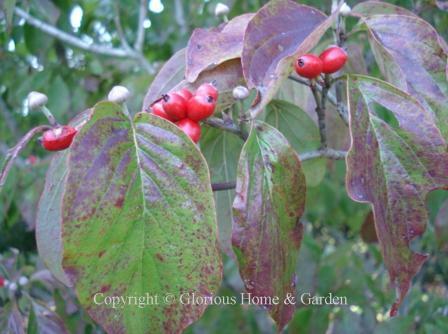 Picture below taken at the Daniel Stowe Botanical Garden in Belmont, N.C.
Ilex decidua, possumhaw holly, Zones 5-9. 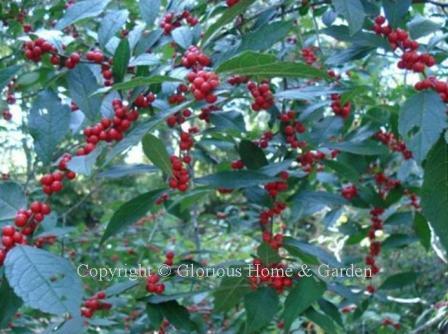 A a great native American holly for autumn berries. 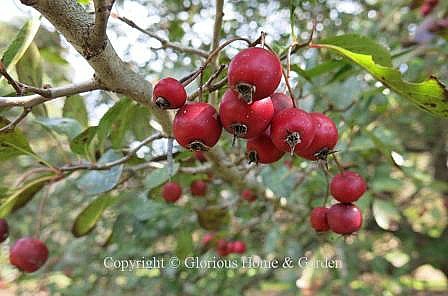 Possumhaw holly produces prodigious quantities of fruit. Very ornamental, but needs room as they can get quite large (about 15' -20'). 'Red Cascade' shown below taken at Daniel Stowe Botanical Gardens in Belmont, N.C.
Ilex vomitoria, Yaupon holly, Zones 7-10. 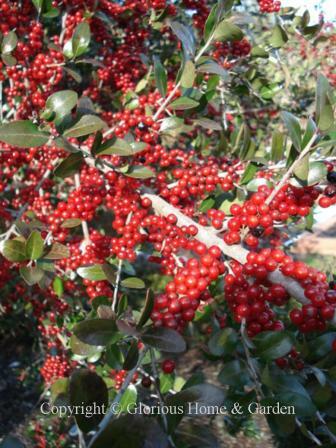 Brilliant red autumn berries make this holly highly ornamental fall until spring in areas where winters are milder. The weeping form I. vomitoria 'Pendula' makes a beaufiful specimen. 'Katherine' is a particularly good yellow-fruited form. Iris domestica, blackberry lily, Zones 5-10. 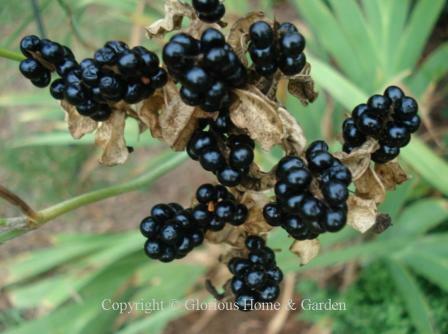 The seed pods split open in the fall to reveal clusters of shiny black seeds that resemble blackberries. Formerly known as Belamcanda chinensis. Koelreuteria bipinnata, Chinese flame tree, Zones 6-8. I love these papery, puffy, pinkish seedpods in the fall. They are very ornamental, and look like little Chinese lanterns. The pods follow the long panicles of yellow flowers that bloom in late summer when little else is blooming. 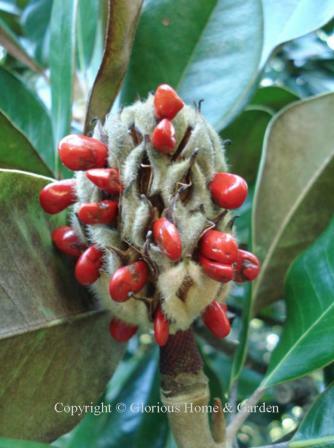 The picture below was taken at the Daniel Stowe Botanical Garden in Belmont, N.C.
Magnolia grandiflora, Southern magnolia, Zones 7-10. Large velvety cone-like fruits ripen in the fall to a lovely rose-red then split open to reveal the red seeds. Quite handsome on a large mature tree and interesting to use for decorations. Malus, crabapples, Zones 4-7. There are hundreds of cultivars. Check with your local nursery for disease-resistant varieties recommended for your area. Some cultivars noted for their ornamental fruit are 'Autumn Treasure,' 'Bonfire,' 'Donald Wyman (pictured below),' 'Jewelberry,' 'Molten Lava,' 'Red Jade,' M. sargentii, 'Sentinel,' ' Sugar Tyme.' Fruit often persists through winter until eaten by birds. Malus sargentii, Sargent crabapple, Zones 4-7. An excellent crabapple with good disease resistance. 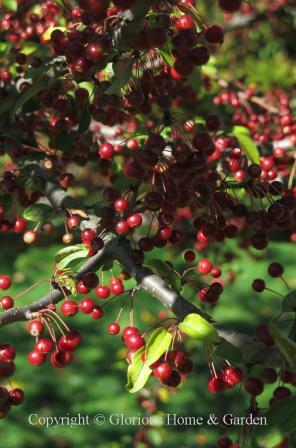 This spreading crabapple is smothered in a cloud of white blooms in spring and is followed by heavy fruit production in the fall which is quite ornamental. Myrica cerifera, Southern waxmyrtle, Zones 7-11. The Southern equivalent of the Northern bayberry. 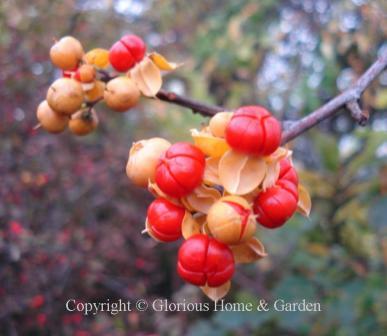 A fast growing plant, and birds love the berries. Myrica pensylvanica, Northern bayberry, Zones 3-6. The female plants produce the small gray, waxy berries that are used to make fragrant bayberry candles. Good to use in a coastal environment. Nandina domestica, heavenly bamboo, Zones 6-9. 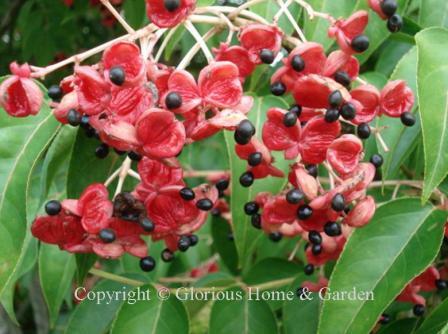 The large pendulous clusters of orange-red autumn berries are long-lasting and a favorite for Christmas decorations. 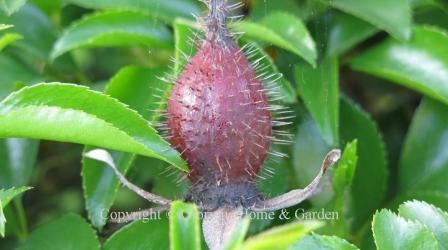 Punica granatum, pomegranate, Zones 8-10. 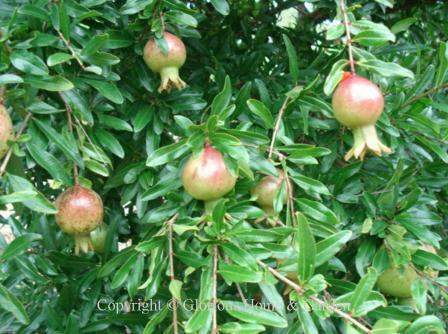 Pomegranates ripen in the fall and have become very popular to use for holiday decorations. 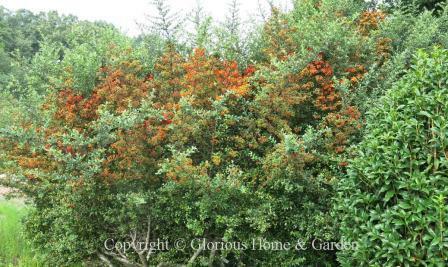 Pyracantha coccinea, scarlet firethorn, Zones 6-9. 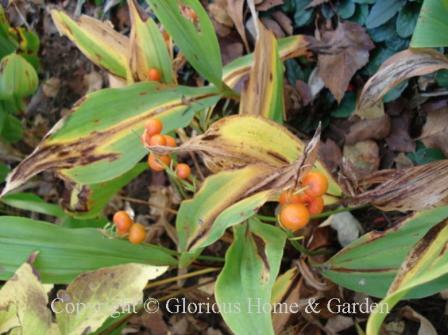 Usually very abundantly produced and showy orange to red autumn berries that can persist a long time. Can be trained as an espalier on a wall. Beware of the thorns! Rosa eglanteria, eglantine or sweetbriar rose, Zones 4-10. The rose of Shakespeare not only has apple-scented foliage and sweetly-scented flowers, but its oval hips persist through winter. Said to be a very long-lived rose. Rosa foliolosa, leafy or prairie rose, Zones 6-10. This rose is native to the southern mid-western states.. 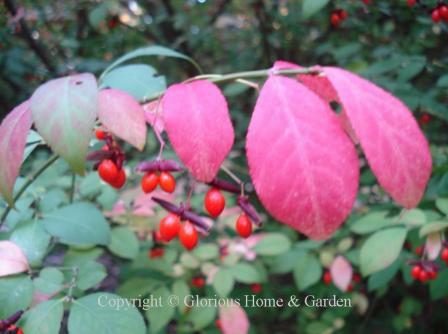 It has few thorns, and produces bright pink fragrant flowers followed by numerous hips and good fall color. The name comes from the abundance of narrow leaves. 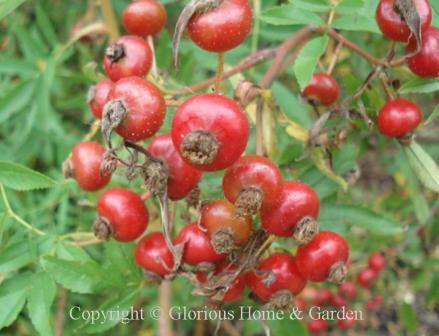 Rosa glauca, redleaf rose, Zones 2-7. This rose is worth growing for the purplish (some say blue) leaves as for the rounded, red hips with long sepals. Rosa laevigata, Cherokee rose, Zones 7-9. Large white blooms in spring are followed by prickly hips in fall. Rosa moyesii, Moyes rose, Zones 5-7. Clusters of elongated red hips are produced abundantly and are quite decorative in the fall. 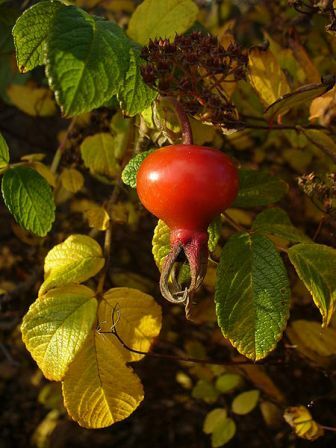 Rosa rugosa, beach rose, Zones 2-7, long-lasting large tomato-like hips form in late summer through fall and are very decorative. Can be used to make jams, jellies and teas. Symphoricarpos albus, snowberry, Zones 3-7. 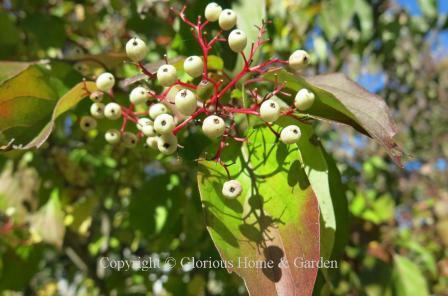 A native American shrub with distinctive white autumn berries. Not an outstanding plant in the garden, but good for shady locations. Interesting to use in fall arrangements. Symphoricarpos orbiculatus, coralberry or Indian currant, Zones 2-7. This is a small native shrub with arching branches that could be effectively used in a woodland garden, as an informal hedge or to control erosion. The flowers are inconspicuous, but the slender branches are laden with pinkish-purple autumn berries that persist through winter providing food for birds. 'Central Avenue' (pictured at the Daniel Stowe Botanical Garden), was apparently discovered on Central Avenue in Madison, Georgia in dry, shady conditions, and is used effectively here with purple ajuga. Symplocos paniculata, sapphireberry, Zones 4-8. Lovely sapphire-blue berries in the fall. Appreciate them before the birds devour them! Viburnums are among the best shrubs for fall color and autumn berries, rivaling hollies for the honor. Some viburnums are best for spring bloom and fragrance, these below are outstanding for their fruit. Viburnum dilatatum, linden viburnum, Zones 5-7. Excellent choice for the garden border due to its showy white bloom in the spring, fall leaf color and outstanding autumn berries. The fruits resemble cranberries and indeed look like dried cranberries by the end of winter, but that is when the birds prefer them when not much else is available. 'Asian Beauty,' 'Cardinal Candy,' 'Erie,' 'Iroquois' are all good selections. 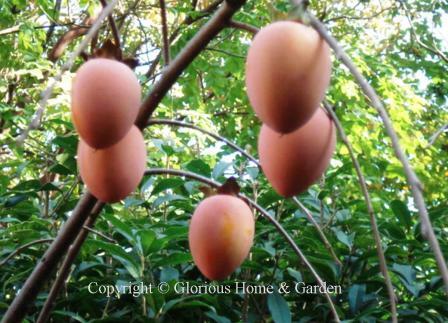 Must have another cultivar in vicinity for good pollination and fruit set. 'Michael Dodge,' shown below, has yellow fruits. Prefers the cooler temps of the North (I am jealous! ), or try in partial shade in the South with consistent moisture, but good drainage. Viburnum opulus, European cranberry bush, Zones 3-8. Bright red fruits ripen in the fall and persist through the winter. 'Compactum' is smaller shrub than the species and has brilliant fruit; 'Xanthocarpum' is a yellow-fruited form. Viburnum sargentii, Sargent viburnum, Zones 3-7. 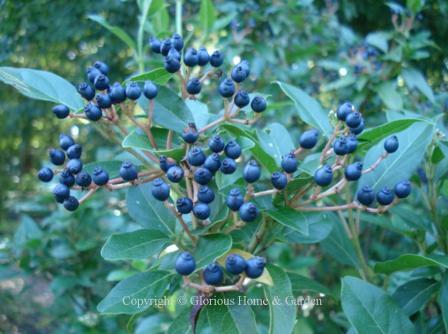 Quite a large shrub (can reach 15' x 15' proportions), it nevertheless produces clusters of persistent red berries late summer into fall as well as good fall leaf color--if you have the room for it. Best in Northern zones. Viburnum setigerum, tea viburnum, Zones 3-7. Not the most beautiful viburnum as far as form (leggy) or leaf color (unreliable) are concerned--this one is grown for its showy clusters of red fruit which ripen in early-to-mid fall. The leaves have been used to make tea. Viburnum x rhytidopylloides, a cross between V. lantana and V. rhytidophyllum, Zones 5-8. Fruits mature from yellow to red to black in late summer and fall. A good choice for the South as it tolerates heat better than some others. 'Alleghany,' and 'Willowwood' are good selections. Be sure to have a couple of cultivars in the area for good pollination. 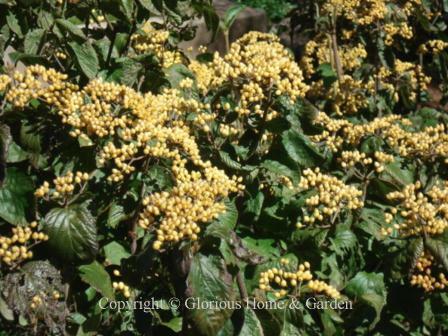 Viburnum tinus, laurustinus, Zones 8-10. This is a nice evergreen shrub for the milder areas of the country. It makes a nice hedge, and I have had good luck with it in Zone 7b. 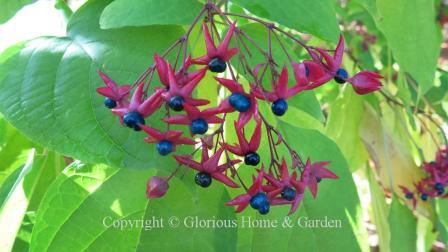 Fall brings clusters of metallic blue fruits that are quite ornamental as on 'Spring Bouquet' below. Viburnum trilobum, American cranberry bush, Zones 2-7. 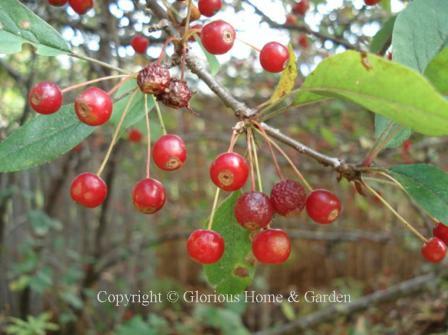 An outstanding native shrub excellent for fall into winter fruit display. The edible cranberry-like fruits provide food for birds in late winter. Best in the North as it does not relish heat and humidity. 'Wentworth' is an excellent cultivar.